No Cheap Tricks Used in Modifying this Machine! This MR-S built by Half Way, first came into the scene when it took first place in the Option2 endurance race. The K20A engine was transplanted into the vehicle last year and was taken even further this year by increasing the displacement to 2.4 liters. The body was widened to make up a completely tuned time attack monster. Swapping in a new engine into an MR-S may seem like a huge ordeal to many, but they had a perfectly good reason for performing this change. Half Way wanted a lightweight midship vehicle to use as their demo car, so the perfect candidate was the MR-S. However, the 1ZZ engine that comes equipped with the machine did not entirely satisfy their needs. Every modification possible was performed to extract more impact from the motor, from basic bolt-ons to a full blown turbo setup. The engine failed to live up to their expectations. The only step left after all these modifications was to fully build the internals of the motor and crank up the boost. If the car was to be taken to this level, the boys at Half Way felt as though the amount of money spent was not worth the hypothesized result. Even if the motor was meticulously maintained, other factors have to be looked into such as the added stress to the drivetrain. Thinking harder into the future of their demo car, it was decided that the vehicle was going to be transformed into a machine that will cause some commotion. 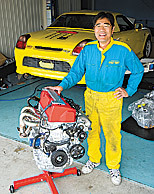 Here, the idea that they had in the past of installing a VTEC engine into the MR-S was carefully implemented. The 2 liter K20A motor including the transmission was dropped in along with a custom driveshaft. For the installation of the new transplant to go as smooth as possible, no small details including the minutest parts were sourced and were ready to be put in. The most difficult aspect of the motor swap was the computer related problems. The general idea of their machine was to construct a street driven vehicle; meaning that the air conditioning and the power steering to be fully operational. In order for these components to function properly, the ECU from the previous engine (1ZZ) needed to be used. For this to work on the new Honda K20A ECU, all the information passed through the sensors needed to be identical to the 1ZZ ECU or else the CAN (Controller Area Network) communication would throw error codes. On the engine, Toyota components were custom fabricated such as the crank sensor to remedy this obstacle. These kinds of problems would have been no concern if this was going to be a full out race car, but it was purposely built to be a fast daily driver. This setup should prove to be fairly trouble free since it is naturally aspirated as well. The results should be astounding; with the entire machine weighing in at less than 1 ton and a killer engine, it poses a serious threat to the current N/A vehicle record at Tsukuba Circuit. A powerful K20A engine from a DC2 was installed along with K24 components to increase the displacement. The vehicle is as light as a S2000, perhaps even with more potential. Their main objective now is to break the N/A record time at Tsukuba Circuit. Rather than to use an oversized air cooled oil cooler, a mid sized water cooled unit was used. This was found to be the more efficient choice. The only downside was the complicated piping layout. The exhaust system present on this machine is a custom track only version. This version may not be used in the streets since the catalytic converter had not been taken into account. The exhaust system on the market had been passed with a stock MR-S catalytic converter and muffler to meet the required astringent law. The engine itself is controlled by the DC5 ECU, and the original MR-S ECU controls the rest such as the gauges and air conditioning. The MR-S CAN communication factor requires the proper signal from the engine for it to work, so Toyota sensors were fabricated onto the K20A. Half Way claims that they gained vast knowledge of the modern vehicles by constructing this machine. The black box shown is a Toda Racing ECU for the DC5. A regular Integra ECU would have worked as well. The brakes kick in very hard. These were chosen since the car remains lightweight and Halfway didn’t want to increase the spring rate. The stock brakes were utilized so the normal braking capacity can be used to the threshold. The suspension itself is a custom unit built by Halfway. Every component from the length of the shocks to the valve shims were meticulously chosen. To improve the vehicle weight balance, the battery was moved more forward. Anything that weighed over 30lbs was shifted towards the front of the vehicle. Since the MR-S is a midship configuration, they needed all the weight possible to fight the uplift of the nose during acceleration. A portion of the power steering assembly had been moved up front as well. Half Way claims that while construction, the body kit was not intended to be put on the market. All the body components were made so that all the pieces were needed to be used in order to bring out the intensity of the kit. No single piece can be used individually. Front bumper / front fenders / hood / side skirts / rear fenders / rear bumper / rear hood; a 10 piece set retails for 525,000 yen. The body kit increases the width of the body by 45mm each side. "Over 10 trouble free machines already constructed!!" "We believe we share the same mentality of the rest of the MR-S owners when it comes to the good and the bad of the vehicle. We would have never thought that our demo car would end up with a Honda engine? But after much research and success, we have completed the 10th MR-S to sport this setup; all trouble free of course. To please our loyal customers, we would like to continue modifying one vehicle at a time."